The American Friends of Monaco have reported on the historic upcoming visit this year of His Holiness Pope Benedict XVI to the United Kingdom. This will be the first official papal visit to England in history, the only previous visit being a pastoral trip by Pope John Paul II. Catholics in Britain for the papal visit will also have the opportunity to see something from the Catholic Principality of Monaco as the occasion will coincide with the exhibition of "Grace Kelly: Style Icon" which will leave Rome and be on display at the Albert & Victoria Museum in London from April 17 to September 26. The exhibition will include over 50 items once belonging to HSH Princess Grace of Monaco such as clothes, hats, jewelry and accessories. The displays will trace the transformation of Grace Kelly from icon of the golden age of Hollywood to Princess consort of Monaco. Some notable items that will be included are some of the dresses from her film (one of my favorites) "High Society", the gown she wore to the 1955 Academy Awards in which she won her Oscar (the award itself will be on display) and posters, photographs and clips from her films. The exhibition was first unveiled at the Grimaldi Forum in 2007 and has been displayed in Doha, Paris, Moscow and Rome after leaving Monaco. Currently the Principality of Monaco does not have full diplomatic relations with the United Kingdom but has long had consular relations with the country. The current Consul General of the Principality of Monaco in Great Britain is Mme. Evelyne Genta. 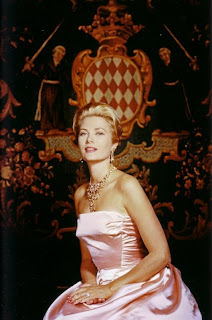 To quote the Friends of Monaco, "There is no doubt that even after her death twenty-seven years ago last September, the late Princess Grace of Monaco still remains a Catholic royal icon of great interest to the world—and as the Sovereign Vicar of Our Lord Jesus Christ the King on earth, so too does the Catholic papal monarch, Pope Benedict XVI. Together, both events, the visit of Pope Benedict XVI and the Princess Grace exhibit will draw standing-room-only crowds in Great Britain as they continue to do in Rome, if for nothing else but for the cause of satisfying latent historical and cultural curiosity of the UK masses in an era of dying icons of sustaining truth and enduring beauty." More information on the exhibit at the Albert & Victoria Museum in London can be found at the Museum’s website at www.vam.ac.uk/exhibitions/future_exhibs/index.html.